New research by Wandsworth Council has strengthened the case for more low emission buses to be introduced on routes through Putney High Street. A detailed analysis of the vehicles using the road has now been completed which shows that more than two thirds of nitrogen dioxide exhaust emissions come from buses. The street - which is used by thousands of pedestrians everyday - suffers from consistently high levels of air pollution caused by traffic. With more than 100 buses use the road every hour. The council’s findings have now been presented to Transport for London (TfL) which is currently deciding which of its buses will be retrofitted with pollution reducing equipment and which routes will be given top priority for its next batch of greener hybrid buses. Some bus routes which run via Putney High Street have already been earmarked for the greener models. They will start coming into service in October this year. 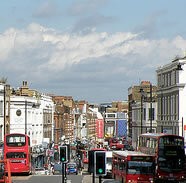 “This new research has pinpointed buses as the main source of nitrogen dioxide pollution on Putney High Street. If we are to improve air quality here then these vehicles must clean up their act. “Tfl has already pledged green buses on three routes and this is a decent start. However, much more needs to be done if we’re to make a significant improvement to air quality. We need more hybrids deployed here and every diesel model must be retrofitted with nitrogen reducing catalytic converters. The campaign for greener buses in Putney is backed by local residents, the Putney Society and GLA member for Wandsworth and Merton Richard Tracey. 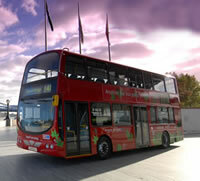 Transport for London is set to introduce 90 new hybrid buses across London in 2012. These buses pump out less particulate matter and nitrogen dioxide pollution and are quieter than conventional diesel models. A further 1,000 London buses are set to be fitted with nitrogen dioxide reducing catalytic converters.